Ahhh, Peaches!! 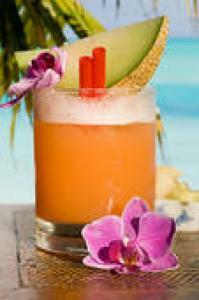 They are one of the sweet and juicy gems of late summer. 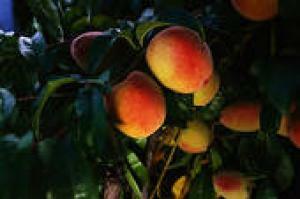 Fast growing peach trees, will reward you with golden peaches, in just a few years. They are, however, highly susceptible to both insect infestations and plant disease. 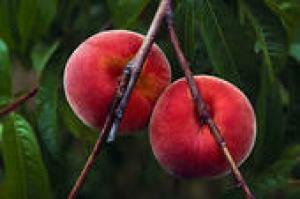 To grow peaches successfully, you need to spray the trees regularly. Did you Know? Peach pits are poisonous. We don't think you are going to eat the hard pit. But, we thought you should know. 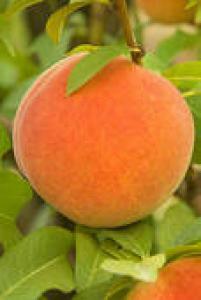 Peach trees are grown from seed.... the "pit". It takes three or four years to go from the seedling stage to a fruit-producing tree. Most people don't want to wait that long. They turn to garden nurseries to purchase young trees that can be transplanted to your garden. Trees at your local nursery are a couple of years old. This small peach tree will still need to grow another year or two to get the first crop of peaches. You can also graft branches from a peach tree onto other fruit trees. Select a location in your yard that receives full sun. Dig a deep hole. Add plenty of decomposed compost, if available. Mix thoroughly with regular garden soil. If the tree you have bought is inside of a peat pot, leave it in the container. It is helpful (but not required) to slit the container to allow roots to more easily exit the container. While making the slits, be careful not to cut the roots, as you can do more harm than good. If your tree is in a burlap bag, remove the bag. Gently spread the roots in the hole you have dug. 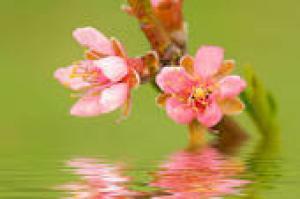 Once your new peach tree is planted, it should grow quickly. We recommend staking the tree in its first year of life. Strong winds can bend the young sapling, causing the trunk to grow at an angle. Really strong winds, might even cause the tree to sway and damage roots. 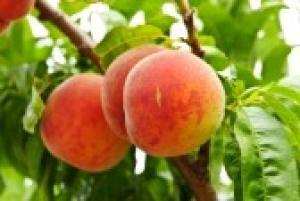 Tip: Fruit tree fertilizer spikes are a great way to boost the growth of your new peach tree. The spike slowly releases a fertilizer specifically formulated for fruit trees. The size and number of peaches is dependent upon a number of things. As a rule of thumb, more peaches on a tree, results in smaller individual fruit. Sometimes, mother nature pollinates a profusion of blooms. Sometimes frost nips a portion of the blooms. However, in a good year, it is possible that so many peaches are on the tree, that the size of the fruit is small. Growers can compensate for this, by removing a few of the baby peaches very early in the season. Should you do this? Probably not in your first few years of growing, as you do not have the experience to judge if there are too many peaches on the tree. 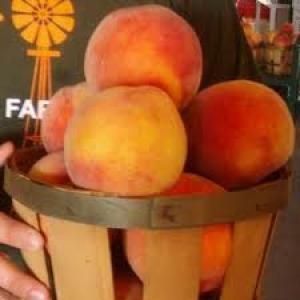 But, we do recommend removing any peaches that are damaged by insects, leaving good peaches to grow even bigger. Each spring, before buds open, apply a dormant oil fruit tree spray. This will kill a variety of insects. Peach trees are highly susceptible to both insect infestations and disease. 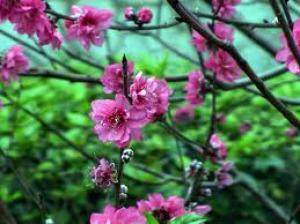 Without regular spraying, peach trees tend to be short-lived. We highly recommend a regular program of spraying for both insects and plant disease. If you use insect and/or disease sprays, we recommend you follow the directions on the label carefully. And by all means, wear protective clothing and a mask when spraying.